Hammon Lady Warriors 8U Win Third in State! 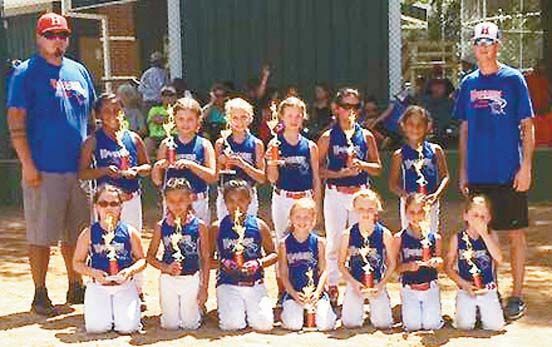 The Hammon Lady Warriors 8 & Under Team played in the State Tournament last week in Preston. The Lady Warriors placed Third in the State! Pictured, front: Kira Harris, Jordin Espinosa, Declynn Bullcoming, Allee Baker, Breelee Trench, Paige McIntosh, Calliy Walker. Back: Danika Bullcoming, Josie McGlothlin, Jacee Baker, Harley Travis, Emma Krapcha, Ra-Kayah Davis-Pratt. Head Coach Brice Baker and Assistant Coach Edward Krapcha.